WASHINGTON, Feb. 26 – Sales of newly built, single-family homes rose 9.6 percent to a seasonally adjusted annual rate of 468,000 units in January from an upwardly revised pace of 427,000 units in the previous month, according to data released today by the U.S. Department of Housing and Urban Development and the U.S. Census Bureau. This is the strongest sales pace since July of 2008. Regionally, new-home sales were generally strong with three of the four regions posting large gains. The South, the West and the Northeast showed improvement, with respective increases of 10.4 percent, 11.0 percent and 73.7 percent. New-home sales in the Midwest fell by 17.2 percent. The inventory of new homes for sale remained steady at 184,000 units in January, which is a 4.7-month supply at the current sales pace. You almost want to call it a bubble, don’t you? In the global real estate biz, China is the buzz. Every other week there is a story about how much money the Chinese are spending abroad on real estate. I’ve done them here a number of times myself. And it seems there are companies sprouting up designed to cater to China’s uber-rich; from Affinity China to Bomoda, there’s a savvy entrepreneur out there luring starry-eyed, super rich and a little impractical Chinese from buying a part of the Western dream. Like Honiley Hall in Warwickshire in the U.K. It’s only about $15 million dollars. But that comes with 35 acres of land and a driveway that is bigger than most back yards at 1,312 feet long. This isn’t a house for the curious to go look at it and dream big. This is by appointment only. This is a house for the rich. And judging by an ad from the Peter D. Warwick’s namesake luxury property firm PDW, it’s mostly for the Chinese with lots and lots of crazy cash to burn. These guys are just over-the-top now, aren’t they? If they’re not buying up Sunseeker yachts just because they are the ones seen in the latest Bond movie, they’re out spending hundreds of thousands of dollars on American style weddings. Remember the Happy Meal toys and the dollar-a-day Chinese? Apparently, those people no longer exist in China. Everyone in China now is a millionaire and Americans and Europeans want to sell them the high life. Starting this weekend, some 14,000 high-net worth Chinese will attend the Top Marques super luxury expo in Shanghai and guess who is going to be there? How about Miami real estate firms? How about realtors from the English countryside? Miami real estate broker Jorge Martinez of Worldwide Properties, together with co-founder Roland Ortiz, and senior agent, Olimpia Zanardi, will be the first American real estate agents at the expo to showcase property alongside private jets and Ferraris. They’ll be touting their wares: $2 million South Beach penthouses at Venetian Way. If you’re from Miami and thought your real estate values weren’t priced to match the state’s 7% unemployment rate, blame a rich foreigner. This isn’t to incite riots, of course. But the rich love Miami, and the Chinese love Florida, second only to California as their go-to state for second or third homes. Paradise Waters. If you have to ask where it is, it’s probably because you can’t afford it. Top Marques is usually just for expensive toys. But this year, expensive housing is up for a look, too. It’s one more expression of how Chinese high-net-worth individuals have become so internationally sophisticated, and so wealthy, that they can pick up second homes in other countries like they would a designer purse or car. It is also a sign that Western real estate agents are waking up to the Chinese market, and starting to target these guys aggressively. The Miami Association of Realtors says Florida is “a top state” for foreigners, with Miami claiming the most investment. This year, the Association is traveling to China for property shows and business meetings in Chengdu, Guangzhou, Shanghai, Beijing and Hong Kong. The number of foreign-born Chinese Americans in the US doubled between 2000 and 2010, according to a UN report, and experts attribute the increase in large part to China’s growing middle class, who have left in droves to pursue education or business opportunities abroad. Among approximately 3.79 million Chinese now living in the United States, 2.2 million were born in China, according to the report by the UN Department of Economic and Social Affairs (UN-DESA). 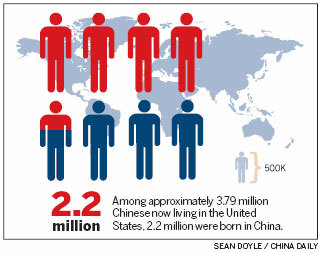 In 2000, 22,000 visas were issued to Chinese nationals in the US; in 2012, that number jumped to 189,000. Increased government investment in China’s education system has also contributed to a larger portion of the Chinese population being able to apply for study abroad, she said. Zai Liang, a professor in the sociology department at the University of Albany with a focus on immigration and Chinese demography, said he believes that the UN figures are slightly misleading. A significant portion of the 2.2 million Chinese-born immigrants currently in the US are in the country on temporary visas for school or short-term business and will not stay, he said. Some of the students may have been counted twice as a result of exiting the country for holiday trips or other short vacations, he said. Other factors possibly contributing to increased immigration from China include lenient US immigration policies that encourage high-skill workers from China to take jobs in the US, said Karthick Ramakrishnan, associate professor of political science at the University of California, Riverside. Ramakrishna directs the National Asian-American Survey, and is working on a book on immigration legislation. The US is working to make its policies more competitive in drawing higher-educated immigrants equipped to work in high-skill industries, he said. Although immigration from China has increased steadily over the last decade, various push and pull factors play a role in how it plays out in developing countries. Increased wealth provides the means for people to leave, but increased opportunity can also attract many to return home upon graduation, Sumption said. Immigration reform in the US will likely continue to prioritize visas for educated, high-skill workers from China, but will make it more difficult for Chinese families to bring extended family members with them when they relocate. Adult siblings will no longer be eligible. The UN-DESA report, which was released ahead of a summit on migration and development held by the General Assembly in early October, noted that 232 million people now live abroad worldwide. In 2000, that number was 175 million. The US remains the world’s most preferred destination for immigration: between 1990 and 2013, nearly 23 million immigrants arrived in the country. “Even though many people think of immigration as being most important to the Latino community, it’s also incredibly important to the Asian community as the US’ fastest-growing racial group,” Ramakrishnan said. Posted in 5 Star hotels on Oahu | Hawaii Luxury Resort 瓦胡岛夏威夷豪华度假5星级酒店, Apartments for Sale 公寓出售物業, Asia-Pacific Region 亚洲太平洋地区, China Luxury Industry Association 中国奢侈品行业协会, China 中国, Chinese Tourist 中国旅客, Chinese Tourists in Hawaii 中国游客在夏威夷, Condos for Sale 豪華公寓, 短期 游学 留学申请 国家汉语, 美国 移民 EB-1 签证 申请, Green Card 绿卡, Hawaii Real Estate 夏威夷房地产, Hawaii Real Estate 夏威夷不动产, Hawaii Real Estate 夏威夷不動產, Hawaii Real Property Tax 夏威夷 房产税, Hawaii Realtor 夏威夷房地产经纪, Hawaii VIP Travel 夏威夷豪华游, Hawaii 夏威夷, Immigrant 移民, Immigrant Investor 投资移民, Interview 采访, Lifestyle 生活方式, Luxury Real Estate 夏威夷奢侈房地产, MLS Real Estate 房地产信息系统, News 新闻.